Arginine has always been a popular nutrient among bodybuilders. Along with its metabolite ornithine, it’s long been touted as stimulating growth hormone. More recently, various supplements that feature forms of arginine have been promoted as nitric oxide precursors. Nitric Oxide performs numerous vital functions in the human body. It dilates blood vessels, lowering blood pressure while increasing blood flow, and the increased blood flow is thought to increase the flow of nutrients and oxygen into muscle. 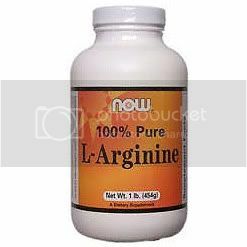 Besides being the direct precursor of Nitric Oxide synthesis, arginine acts as a substrate for the synthesis of proline, the major amino acid found in collagen, which is the primary protein of connective tissue. Arginine is also a primary precursor of creatine. Some studies show that arginine may encourage fat and glucose oxidation because of its link to Nitric Oxide, which in turn, increases the signaling effects of a nucleotide called GMP, which is directly involved in fat burning and penile erection (drugs such as Viagra also work by raising cyclic GMP). While arginine offers heady health benefits, there are problems with supplementing it. In solution it’s strongly alkaline, and it has to be compounded with hydrochloric acid to create a supplemental form. Supposedly that prevents acid-base problems when you take a concentrated dose, but taking more than nine grams a day often leads to nausea, gastrointestinal discomfort and diarrhea. The side effects may be due to the rapid conversion of arginine to Nitric Oxide in the gut coupled with impaired intestinal absorption of other amino acids, such as lysine and histidine.